Time for this year's EAT! 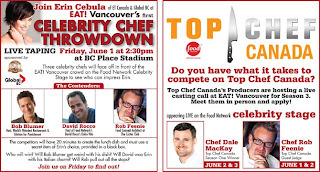 Vancouver event.. here is some information on the 3-day festival..
Celebrity chefs, popular local restaurants, wineries, food and beverage manufacturers, cookbook authors, retailers, artisans, and many others from the culinary world will come together for a three day public extravaganza at the newly refurbished BC Place Stadium. EAT! Vancouver encompasses unique food experiences, opportunities to learn behind-the-scenes culinary magic from professional chefs, dynamic entertainment through celebrity chef cooking demonstrations and culinary competitions, diverse food, beverage and cooking related exhibits; and of course fantastic shopping opportunities. Come for lunch and stay for dinner at EAT! Vancouver's Bite of Vancouver restaurant pavilion. 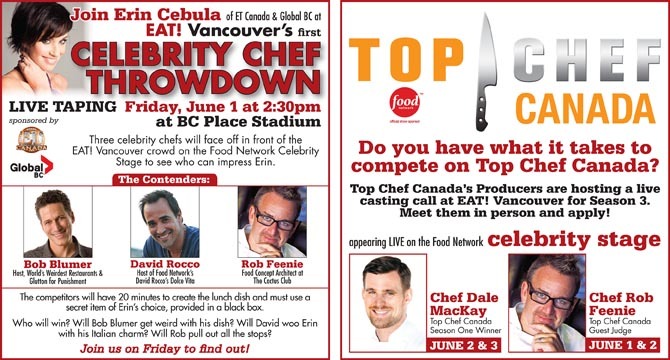 The chefs of favourite Lower Mainland restaurants will serve up appetizer portions of their signature recipes. For a nominal charge ($1.00 - $4.00) per item you will be able to savour the flavours of numerous eateries. Beer, wine and spirits will be well represented in the Tasting Pavilion where you can sip and taste hundreds of different beverages. Hosted by Daenna Van Mulligen, Vancouver’s Wine Diva, the Grapes and Hops Stage will feature presentations and tastings of numerous local and regional beers and wines conducted by a variety of industry experts. While at EAT! Vancouver, you will also enjoy shopping in the marketplace of over 250 exhibit booths. Producers, manufacturers, retailers and food artisans will showcase a wide assortment of unique products for eating, drinking, cooking, entertaining, and outfitting a kitchen. Exhibits will include everything from gourmet foods to kitchen accessories. Improve wine + beer appreciation in Grapes & Hops Seminar area. EAT! Vancouver is Canada's largest consumer food, beverage and cooking festival taking place at BC Place Stadium, Vancouver, BC on June 1 - 3, 2012. The food show features hundreds of food, beverage and kitchen goods exhibitors along with wineries, breweries, restaurants, cooking demonstrations, wine and cheese seminars, cookbook authors, and chef competitions. I'm planning to this year, also to check out last year's clips watch the video below. G.NA Releases New Music Video For "2Hot"
A Pink Releases Their New Music Video "HUSH"
INNA Releases New Song "Alright (by Play&Win)"
INNA Releases New Song "OK (by Play&Win)"
TV Tonight: 90210 "Tis Pity"